The Meizu M3 Max is a full-fat phablet that incorporates a huge battery, familiar design and a reasonable camera in a package that’s incredibly affordable. However, Meizu's Flyme OS won't be everyone's cup of tea. When it comes to smartphones, consumers are more savvy than ever these days, and aren’t necessarily blinded by the biggest names in mobile. After all, even the most expansive flagships can still catch on fire, or bewilder users by omitting a headphone jack. And with even the likes of Samsung and Apple capable of turning off potential customers, more and more previously unheard-of Chinese brands are waiting in the wings with smartphones that seem to tick all the right boxes, at seemingly ridiculous prices. One such brand is Meizu, a company that will be familiar to those of you residing in China, India and other parts of south and eastern Asia, as it seems to release more new phones than anyone else. The Meizu M3 Max is a case in point: it could easily be mistaken for an iPhone 6 Plus on a dark night, with hints of the HTC 10 thrown in for good measure. 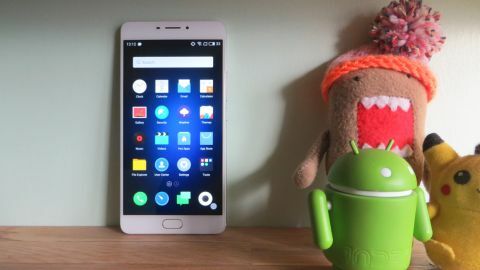 The Meizu M3 Max is available directly from Meizu’s own online store, MeizuWorld.com;the usual price is $329.99 (£280.49, AU$481.79) , although at the time of writing it's discounted to the very tempting price of $259.99 (£220.99, AU$379.59). This 6-inch phablet comes in four familiar colours: rose gold, silver, grey and gold. Each model incorporates a 10-core Mediatek processor backed by 3GB of RAM and 64GB of storage, a plentiful package that’s more than enough to power Meizu’s fully-skinned version of Android 6.0, Flyme OS. There’s also a 13MP camera with dual-LED flash, a 5MP front-facing camera, a fingerprint sensor and a humungous battery weighing in a 4100mAh. At first glance there appears to be everything you’d want or need in a smartphone – but is there any more to the M3 Max than meets the eye? If you're familiar with any of the other smartphones in Meizu’s lineup, the look and feel of the M3 Max will be fairly familiar. While it wouldn't be considered a 'premium' phone, the build quality is very solid without feeling overly heavy or bulky. Weighing in at 189g, and measuring just 7.94mm thick, the M3 Max manages to combine a slim feel with well-balanced heft. There aren't any unusual design choices to note – a volume bar sits a third of the way down the right-hand side, with a power button located just below; both respond to presses with a satisfying click, and don't wobble or move around like those on some other budget handsets. The opposite spine is home to the tray that holds your nanoSIM card and a microSD card, and which can double as a dual-SIM card tray if you prefer. The bottom edge is home to micro USB and 3.5mm headphone sockets, and the single speaker, in a layout that's almost indistinguishable from that of the iPhone 6. The silver chamfered edges on the rear of the phone are somewhat reminiscent of the HTC 10, though the dual-tone LED flash is located below the camera, which – unlike on the HTC – is flush to the body. There's another little nod to Apple's design in the shape of a tagline inscribed on the rear of the phone, saying 'Designed by Meizu, LTE Mobile Phone Assembled in China'. It's not quite as glamorous as Apple's 'Designed in California' slogan, but the two brands share a similar production pedigree – Meizu's phones are assembled in Zhuahai, a small city just across the estuary from Shenzhen, where the iPhone is made. On the front of the phone, a multi-function home button below the screen doubles up as a fingerprint scanner, replicating recent Samsung and HTC handsets. Everything else on the front is unsurprising – the bezels either side of the screen are fairly slim, but not as small as those on the 5.5-inch Nubia Z11, although we're happy to see that very little real estate has been wasted above and below the screen. The screen itself is a 6-inch, 1080p panel, which might not be the highest resolution available, but has a density well above the 'retina' standard, meaning you’ll never see pixels with the naked eye. Screen brightness is exceptional and viewing angles are good, but, as on cheaper IPS screens, black levels are relatively poor.